You often wonder what kind of force can makes us so passionated about these cars. Is it the design? Is it the rarest accessories? Is it restoring them? Is it driving them? NO, as Brezelfürsten said it, "It's FINDING these cars that makes life worth living"... So when others jumps off a cliff with a parachute, we open another door to an old barn. This is the unreleased footage of Fürsten finding his newest trophy. Can it get any better? And to keep the 6V boys and the visitors happy, we bring out babe no. 3. I'm not sure what this pose is supposed to illustrate, but early in the fifthies this was probably kind of dirty =) Maybe she just wants some Hüls recliners for her split? Well this one is a little tougher... What would you choose? 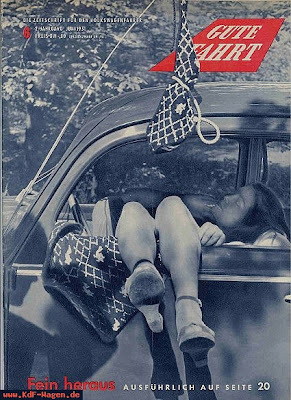 The girl or the car? For me it's not that hard, I have no doubt about who looks the best now, 50 years later =) Even though she may be a widow sitting on a split cab. Have Oval57 already got his Christmaspresent? Yesterday I went for a little trip in the mountains here in Buskerud. I think I was lucky with this catch. What do you think? I also got two windscreen with the BIG SEKURIT-logo on. Most of the glass can i offer for SplitBoy. When I travel around like this I always think on my friends (VW-nuts) in the garage. 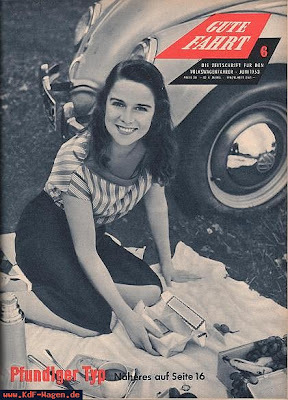 Girl no 1 looks very pleased with her split beetle, who wouldn't? This is a private collection of books, but is a great database for finding a book you are looking for. Some books are also for sale under a seperate section. Knechten is getting old to day! Here is a nice picture from our Annual meeting in Drammen. He got this award for his amazing welding on his 52. In the garage right now we are on VERY different levels. Knechten did put his Zwitter on the pan last night, thanks to the "well-bodied" Fursten and me. He is going on with bolting the chassis to the bodyshell. Lucky man! Knechten can maybe show you a little videoclip? My dad made a nice "Dolly" for my Capitan. See my blog for mor details! This Saturday the annual gathering of the 6V OutlaVWs took place in clean surroundings, free from grease and dust. This is the only occasion were the boys come together in decent clothing. After hanging out a whole summer in camping outfits and sleeping among empty beer cans, or working in the garage dirty as german pornstars, it was time to celebrate the season. After an excellent meal, it was time for the official program. A suggestion of changing the clubs name to 12V OutlaVWs were eliminated immediately, and a membership was almost eliminated as well. The conclusion of sticking with 6V one more year was appreciated by the majority. You can read more about the Express Kit at "Oldspeed.ch" and "Gutefahrt" found under our links. In the last we have got a lot of nice feedback for our blogs. But this is the frist time we have registered a link to our blog! 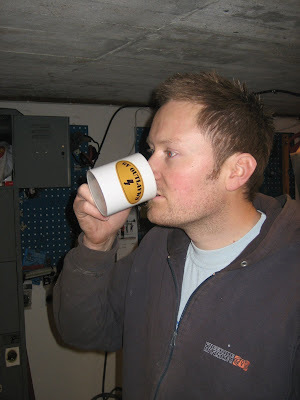 This danish blog is very cool. Go visit them after you have enjoyed our blog first! If you have comments or just want to say how much you love our blog you can send us an e-mail: outlavws@hotmail.com or leave a comment under one of the posts, they are marked as a small letter. Found this new hit single by Carsten Reeder on the net today. An amazing tribute to the Hebmüller. A link to Carstens own site is also added. Above is a picture of Carsten and Brezelfürsten dealing "drugs" at Bad Camberg this summer. 20 years ago theVW scene in Norway was probably in it's prime-time. This was before the internet community ever saw the light of day, and the only influence was through the magazines. The leading magazine covering VW stuff back the was "Right On Magazine" with a mixture of Amcar, bikes, VW's and others. Sitting with a issue from 1988 in my hands I found this ad for tuned VW engines. 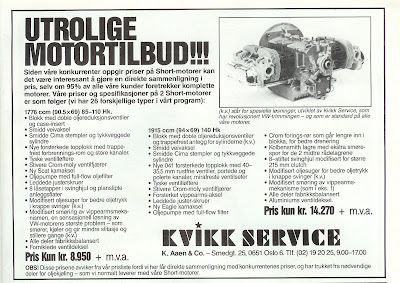 Kvikk Motor was hot back then, and still are are well known trademark in the norwegian VW scene. The 6V Outlavws are happy to have a Kvikk engine in the club. Some more stuff on the subject to be found under Knechtens Zwitter blog.